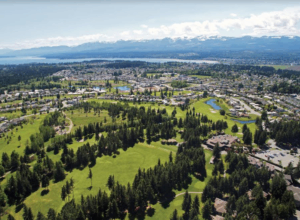 The developers of the Crown Isle Resort Community have received final construction drawing approval from the City of Courtenay for the final extension of Crown Isle Drive – Cambridge Park Estates. Site servicing and road work is underway for Phases V & VI. This is expected to be complete in late September/October, 2018, with registration of the 67 lots to follow shortly thereafter. Integra Homes has a bright and sunny 1,847 sq. ft. single-storey home complete and ready for occupancy in the Hampton Gate subdivision of the Crown Isle Community. This well-designed new home for sale has many features including a spacious great room open to the kitchen, a kitchen island, two bedrooms, a den, a covered patio perfect for outdoor entertaining, as well as a shed and a two-car garage, with additional room for two more cars in the driveway! Crown Isle Golf Course and Community has a number current building lots for sale, with more coming on-line over the next few months. Are you looking for the perfect building lot to build your dream home? Hampton Gate, is Crown Isle’s only gated, single-family subdivision. The final four building lots are now for sale, ranging in price from $239,900 to $299,900. With so many amenities and services as well as adventures as your doorstep, Crown Isle is ideally situated on Vancouver Island. The Comox Valley is located a 30 minute flight from Vancouver and just over an hour from Calgary or Edmonton, Alberta. Crown Isle’s close proximity to the new Comox Valley Regional Hospital, the Comox Airport, medical offices, the Crown Isle Shopping Centre and many local restaurants & retail outlets makes day-to-day life in the Crown Isle Community very appealing for all residents.